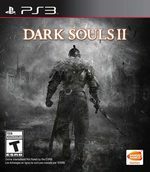 Dark Souls II features a new hero, a new storyline, and an unfamiliar world for players to survive in while delivering its signature brand of unrelenting punishment that players hunger for. Epic battles with gruesome enemies and blood-thirsty bosses await adventurers as they traverse through a devastated world filled with death and despair; only those who are strong willed or cunning can survive this journey to achieve great glory. 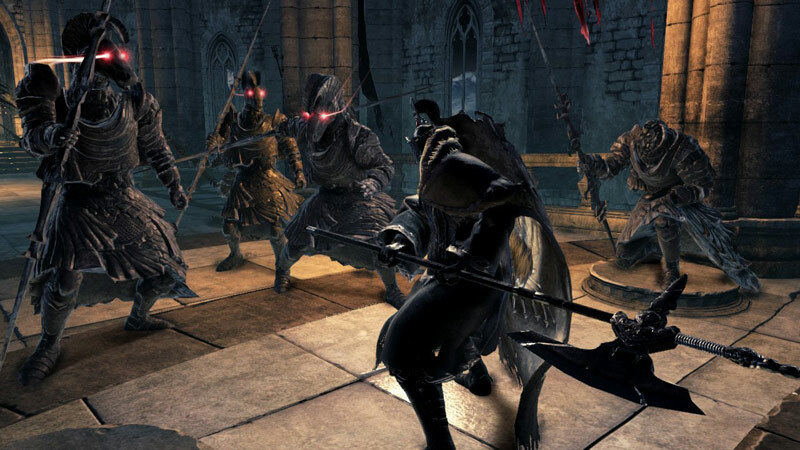 Players seeking to share their experience will discover a revamped server-based multiplayer mode that puts a distinct Dark Souls II twist on the concept of playing with others. There were several times that the direction of my character’s attacks never really seemed to be headed in the direction I was commanding. Lastly, there were some poorly rendered areas of tall grass and trees that looked cheap and kind of low budget against the backdrop of an incredibly rendered background. But all in all, I had no real issues with the game. There wasn’t anything I encountered that would make me not want to continue playing. That being said, I think I am going to go play more…right now. 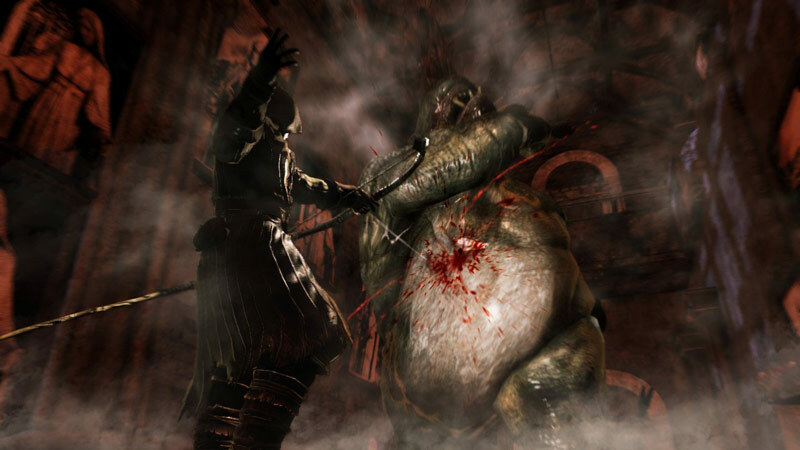 Dark Souls 2 is no ordinary RPG; it consumes you right from the outset. It invites you to explore it and then makes you pay the price. It gives you an item of hope in one hand and then takes it away with the other, yet it’s immensely rewarding when you reach the next bonfire, or beat the next boss. Dark Souls 2 may be the toughest game since Dark Souls, but it’s also one of the most satisfying for those who remain calm enough to persist. Dark Souls II is more refined and somehow more challenging than its predecessor. This is especially so in New Game+ where enemies dish out more damage and you dish out less, albeit with the promise of new items and a better ending. Dark Souls II takes its license for nostalgically old-school difficulty and, whether you're prepared to die or not, will smite you many times over and smile at every cuss word you fling in its direction. Dark Souls 2 is a damn good challenge that asks you to call upon your reflexes, skills, and intelligence to make your way through. To love Dark Souls 2 is an irrational love. It’s an intoxicating blend of masochistic gameplay and mystery that has kept me engrossed for hours and will continue to do so as I play through it again and again. While it may not always feel fair, you’ll be hard pressed to find a game that’s as intense and rewarding as Dark Souls II. The astonishingly deep combat, huge world, unique multiplayer, and amazing overall ambience combine here to create a phenomenal experience. It requires a heavy amount of investment to truly appreciate, but those who put in the effort will fall in love with this torturous title. It’s Stockholm syndrome at its finest. Dark Souls 2 may not be what came before, but it is its own game, with its own hilarious deaths, ridiculous traps, haunting melodies, and foreboding bosses, and it still stands out with ease. That punch to the ribs may not wind as hard, but you'll still want to get up and explore this dark, devious world, over and over again. Most importantly, Dark Souls II continues to capture that awe of not only presenting this world visually, but also seeing something off in the distance and knowing that it's an actual location, not just scenery. The towering black spire looming off ominously on the horizon is all the more ominous just knowing you'll be headed there eventually. If I did have one criticism to leverage against the game it's that the map isn't as well designed as before. It’s this familiarity however that makes DS2 such a refined product. From Software have the formula down to an art form, with the varied environments bustling with interesting and surprising moments. This isn’t a game that suffers from glitches or many wrong moves. There’s a heft, weight, and purpose behind the design, and for the most part, it’s a pleasure to play. Did you like the previous games? If you did, then you are going to love Dark Souls II. It’s more of the same, but with enough differences to really spice things up. If you didn’t, then there’s not enough new features here to attract you to the series. Dark Souls II is a game that caters to its fans rather than than desperately trying to please everyone. And there’s nothing wrong with that. The Souls games have rarely been about fun, but Dark Souls 2's smart tweaks and concessions brought out positive emotions even amidst the pain and exhaustion. It's still a stressful experience, but it's easier than ever to recognize the brilliance in those moments of triumph that make it more than worth the struggle. It is a world of subtle truths that seemingly removes the designer’s guiding hand, leaving a world that is not only cold and unforgiving, but one that is rewarding in its most pure form. It is a magical recipe of pain and frustration that seeks to make you a better player by the end, simply breaking you down step by step, until you feel like you have personally leveled up more than your digital avatar, and that is something not a lot of games can do. Simply put, From Software has done it again with Dark Souls 2. Sure, there are aspects of it that aren’t perfect: There are a few too many boss fights against large “suit of armor” types, there are still some confusing user interface issues, and the visuals have obviously taken a substantial downgrade when compared to E3 2013 demo. However, the fact remains that Dark Souls 2 is one of the deepest, most challenging, and most rewarding experiences you’ll ever have in this modern era of video games. Overall, Dark Souls 2 probably isn't quite the same masterpiece Dark Souls is, but then neither is anything else, and the fact it comes so close is remarkable. From Software has delivered on its goal of opening the game up a bit to more daunted players without breaking the heart of Souls, and Drangleic belongs in the same conversation as Lordran for any number of reasons - but this is still an iterative sequel, so many of the old routines and patterns of discovery inevitably sparkle a little less the second time around. The story isn't much to write home about, either, but if there's interest in a story that doesn't relate to the character, there's still value in it. Visually, everything looks decently impressive, and the OST, while not as diverse or emotional as the previous one, sets the mood. This is recommended for anyone who enjoys simple gameplay with horror themes and a story that plays out like a fable. It's impressive how many improvements From Software has made. If you're a fan of the Dark Souls universe, do not hesitate to play Dark Souls II. Despite a more accessible gaming experience, the game has lost none of its relentless difficulty, and the many improvements make it a great experience for veterans and newcomers. But it may not be for everybody. Extreme challenge translates to a massive sense of achievement when progress is made. Dark, Gothic environment and twisted creature design give the world a unique and scary feel. The game’s approach to online play is still unique. Covenants are way more fun this time. Dark Souls II is a tough, bleak, and frightening action-RPG that is every bit as harrowing yet satisfying as its predecessors. Un juego absolutamente indispensable. En cuanto a la versión de PC, que saldrá el 25 de abril, aún no sabemos gran cosa, ya que no hemos podido probarla. Antes de marcharme a pasar la tarde en el Dark Souls Café, os aviso de que, tan pronto como me sea posible terminarlo, publicaremos un vídeo bastante simpático con nuestra experiencia de juego en Dark Souls II. No, no es un gameplay al uso, será otra cosa. El título mantiene intacta la esencia de la serie de From Software, con una dificultad endiablada que tal vez no sea tan elevada como su predecesor pero que se mantiene en los niveles de la serie. La accesibilidad y guiños al usuario, como un inicio menos traumático, la presencia de viaje entre hogueras desde el principio o algún jefe final no tan duro a las primeras de cambio hacen que la curva de dificultad del título sea más equilibrada, pero no impiden que muramos centenares y centenares de veces y que la experiencia desafiante que desean los jugadores de la saga Souls se mantenga intacta. 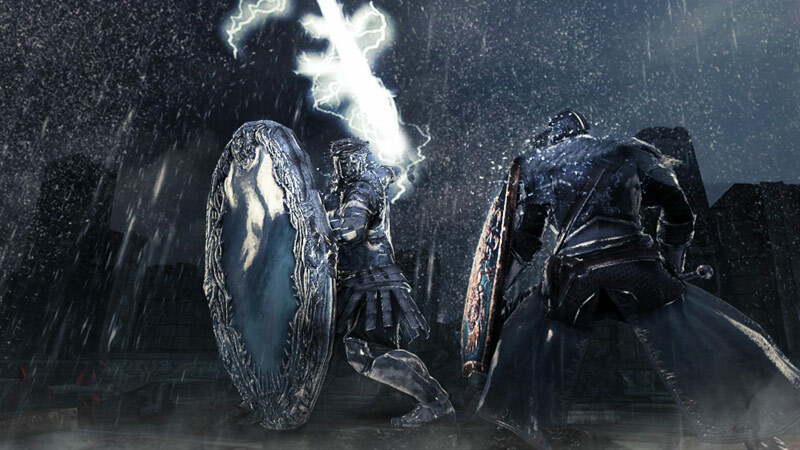 Dark Souls II es capaz de suministrar al jugador dedicado momentos de una intensidad mecánica y de un valor (glups) poético con los que muy pocas producciones de software de los últimos años podrían compararse. Cuando llegamos agotados al final del camino y miramos atrás hacia todos los bosques, mazmorras, pantanos y palacios caminados, hacia todos los enemigos derrotados, hacia todos los enigmas que no se han cerrado, nos damos cuenta del gigantesco viaje que hemos hecho. 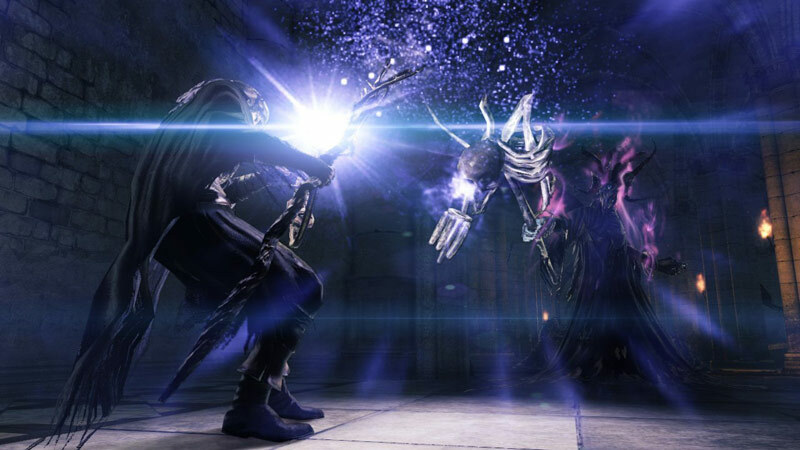 Dark Souls II imprime su propio sello siguiendo la estela que tanto ha gustado a los jugadores. El nuevo mapa es tanto o más largo que el anterior, dejando momentos para el recuerdo y un nuevo motor que se agradece mucho en las nuevas animaciones y efectos de iluminación. Si eres seguidor de la saga, tienes una nueva obra redonda que jugar y rejugar hasta que el mundo vuelva a caer en la Oscuridad. From Software hatte es nicht leicht, denn der Erfolg ihres Spieldesigns ist Segen und Fluch zugleich. Sie mussten eines der besten Rollenspiele aller Zeiten fortsetzen - satte 92% konnte Dark Souls im Jahr 2011 erobern. Ich war komplett fasziniert von diesem archaisch anmutenden Abenteuer, das mit seiner situativen Spannung, seinen Erkundungsreizen und seinem Storytelling an eine Zeit erinnerte, in der man noch voller Staunen und Respekt im Angesicht des Feindes vor dem Computer saß. Und keine Bange: All diese wichtigen Tugenden stecken auch in diesem Dark Souls 2, von dem ich mich kaum lösen kann. Dark Souls 2 est peut-être un peu moins inspiré, moins original que ses grands frères, mais d'un autre côté il est aussi plus maîtrisé, plus propre, finalement mieux rodé que ces derniers. Si les action-RPG exigeants sont votre tasse de thé, si vous aimez les expériences multijoueurs qui sortent du lot et si vous trouvez que les jeux vidéo assistés finissent par détruire le plaisir de jeu, Dark Souls 2 est vraiment fait pour vous. Sans grande surprise, Dark Souls 2 ravira les fans des deux précédents opus et rebutera ceux qui étaient restés sur une mauvaise expérience, dans la mesure où il ne change pas grand-chose à la recette. Les nouveautés, que ce soit au niveau du multi ou du solo, ne sont pas légion et c'est avant tout pour se confronter à de nouvelles créatures et découvrir une nouvelle histoire que ce titre se justifie. Il n'y a pas de bonne raison de jouer à Dark Souls II, il n'y a que de mauvaises excuses pour ne pas le faire. En dépit de défauts récurrents sur le plan technique et de choix de conception un peu bâtards pour ramener des éléments de Demon's Souls, ce nouveau challenge proposé par From Software mérite amplement d'être relevé, pour peu qu'on apprécie de ne pas être constamment tenu par la main et abreuvé de trophées creux. Dark Souls 2 é o último grande urro para uma geração de consolas em fim de ciclo. Um jogo enormíssimo. Desafiante, misterioso, intrigante, complexo e em clara sintonia com as expectativas dos fãs dos jogos anteriores. 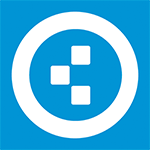 Ainda que possa não surpreender tanto nesta altura por serem já conhecidas muitas das suas qualidades, a From Software não desperdiçou a oportunidade que tinha ao seu alcance para dar ainda mais ênfase ao seu legado. Nonostante qualche difetto Dark Souls II si conferma all'altezza delle aspettative, rivelandosi un gioco ricco, profondo, coinvolgente e progettato con amore. Il rischio di trovarsi di fronte a un sequel scialbo realizzato solo per una mera questione economica è scongiurato. Ora prendete il portafogli, armatevi di tanta pazienza e andate dal vostro negoziante di fiducia. Probabilmente sarà già lì che inizierete a morire. 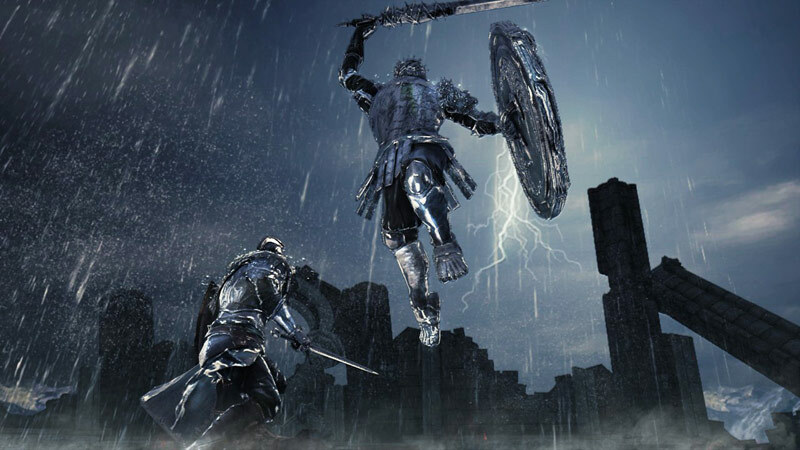 Dark Souls II, così come i suoi predecessori, è il videogioco. È una delle possibili evoluzioni per i videogiochi degli scorsi decenni. Quella in cui, alla difficoltà, vengono affiancati un carisma incredibile e l'immersività di un mondo fantastico. Non è necessariamente l'unica evoluzione possibile, ma è una di quelle possibili. Che per fortuna, grazie a questa serie, esiste. Dark Souls II merupakan sequel yang sangat baik meskipun game ini tidaklah dibuat untuk semua gamer, terutama gamer kasual. Game ini masih menerapkan nilai-nilai gameplay fundamental yang ada pada game sebelumnya serta menambah beberapa fitur yang membuat game semakin menantang. Selain itu, Dark Souls II juga sedikit memperbaiki kualitas visual dan kelancaran bermain yang juga menjadi nilai plus untuk game ini. Door de game toegankelijker te maken voor nieuwkomers is het verhaal gemakkelijker te volgen en geven voorwerpen een duidelijkere uitleg wat ze precies voor effect hebben. Voor de rest is Dark Souls II net zo moeilijk als iedereen gehoopt had. Het heeft even geduurd, maar het is tijd om je personage uit de eerste Dark Souls voorgoed vaarwel te zeggen. Dark Souls II is in ieder opzicht een betere game en wij kunnen niet wachten om te zien welke geheimen zich nog schuilhouden in deze complexe en boeiende wereld. Dark Souls 2 is dan uit en het leven draait de komende tijd enkel daarom. Ik speel 'm als een bezetene en als ik 'm niet speel, borrelt From Software's nieuwe meesterwerkje door in mijn onderbewustzijn. En ik kijk ook zo uit naar de verhalen van alle andere stoutmoedige avonturiers die Drangleic helemaal voor het eerst mogen ontdekken. Dat maak je immers maar één keer mee. Het is een voorrecht om te koesteren.